Ofer military court and prison in the West Bank. Palestinian children detained by the Israeli military are subject to ill-treatment that violates international laws, the United Nations Children’s Fund (UNICEF) said today, as it issued recommendations to improve the protection of minors. Based on interviews with some of these minors, as well as with Israeli and Palestinian lawyers, and reviews of cases, UNICEF concluded that there appears to be a pattern of ill-treatment during the arrest, transfer and interrogation of child detainees. The 22-page report cites examples of arrests of children at their homes between midnight and 5:00 am by heavily armed soldiers, as well as physical and verbal abuse during transfer to an interrogation site, and interrogation using physical violence and threats. The paper also cites “treatment inconsistent with child rights,” including shackling minors during court appearances and incarcerating them in Israel, which isolates them from their families and interrupts their studies. 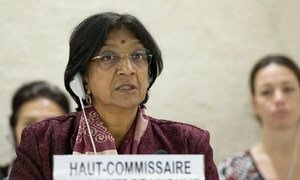 Earlier this month, an independent UN expert urged Israel to end its “appalling and unlawful treatment of Palestinian detainees” after three men went on hunger strike to protest their conditions. In today’s report, UNICEF recommends a series of policy changes that prevent breaches of international laws, as well as safeguarding authorities from false allegations of wrongdoing. Two senior United Nations officials today voiced their concern about Palestinian detainees in Israeli custody, particularly following reports of the fast deteriorating health conditions of several who have been on hunger strike.